Soft, sock-like foot covering with adjustable strap that keeps your foot stretched while resting or sleeping. 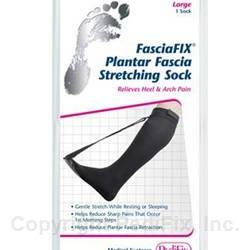 Helps prevent microscopic tearing of plantar fascia ligament, speeds healing. Small fits Calf Circumference less than 7.75"; Medium fits Calf Circumference 7.75-15.75"; Large fits Calf Circumference larger than 15.75". 1 per pack. 1. Open hook and loop straps. Pull sock onto leg, making sure surface is smooth and without wrinkles. 2. Fasten strap around leg, under knee (top strap should rest just under knee). 3. Put long strap though loop and (with foot flat on the floor) pull to stretch the sole of the foot, without hurting. Start treatment by pulling until toes are approximately 3/8? from the floor. INCREASE THE PULL GRADUALLY — leaving no more than a 1? space between the toes and the floor. 4. Adjust for comfort. Fasten. Close all straps prior to laundering. Machine wash in warm water with like colors. We recommend using a laundry bag. Lay flat to dry. Do not dry clean. Material content: 100% spandex. Does NOT contain Latex. Check for correct size. If this is the first time using a support, it is important to start slowly, using it for only short periods of time. Gradually increase wearing time as needed and tolerated. Do not use on open wounds. Make sure that straps are not too tight, and skin is clean, dry and free of lotions. If you have diabetes or poor circulation, consult your doctor before using. If numbness or additional pain occurs, stop use and consult a medical professional. Small P6045-S <7.75" calf circ. <7.75" calf circ. Large P6045-L >15.75" calf circ. >15.75" calf circ.